Torz Cooper had just bought the pet, later named Houdini, when it got out of its cardboard box and through a hole in the dashboard. Ms Cooper, of Mickleover in Derbyshire, said the RAC "tore the car to pieces" in a two hour search for the rodent. The damage caused by Houdini, who was bought for just £7, has cost Ms Cooper £250 but is expected to rise to £1,000. 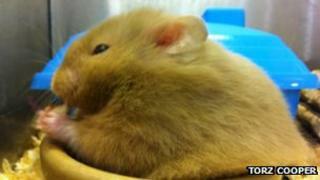 Ms Cooper bought the hamster for her 11-year-old daughter, Heather, from a Pets at Home store near Derby. Heather stayed in the VW Passat while her mother bought groceries from another shop but on her return Houdini was making his getaway. "I opened the door and saw my daughter doing this juggling effect [with the hamster]. As I went to grab it, it bit [Heather] and he shot straight under the back of the dashboard," she said. The RAC was called after their attempts failed to get Houdini out. "This man got out, chuckling to himself, he said 'Is this for real?'" said Ms Cooper. "We had to tear the car to pieces. We took the underneath of the glove box out, we took the steering column off and he shone the torch behind the stereo and he said 'I can see it!'" It took two hours before Houdini was eventually rescued. "We opened the bonnet, up pops Houdini's head, I then scooped him gently up," said Ms Cooper. However, it was not the end of the adventure as Houdini had to be rescued from the jaws of the family cat the next day. "I don't have any regrets at all," said Ms Cooper. "I love animals and my daughter's face when he was brought out just made it worth it."